Received May 3, 2018; Revised June 13, 2018; Accepted June 17, 2018. Understanding the morphological and physiological characteristics which are attributable to determine indica and japonica subspecies of Asian rice (Oryza sativa L.) is important to conceive breeding strategy. However, information of quantitative trait loci (QTLs) associated with targeted traits related to subspecies domestication and differentiation-related traits remains limited. Two reciprocal F2 mapping populations generated from a cross between Ilpumbyeo (japonica) and Dasanbyeo (indica) were developed and used for constructing genetic maps to identify QTLs responsible for subspecies specific-related traits using 107 sequence-tagged site (STS) markers. A total of 26 main-effect QTLs for subspecies-related traits such as grain length, grain width, grain length-width ratio, apiculus hair length, and potassium chlorate resistance, were detected on seven chromosomes (1, 2, 3, 4, 5, 6, and 8). Of the detected QTLs, 14 QTLs corresponding to the previously reported QTLs suggesting the functional conservation of QTLs across populations and the remaining 12 QTLs appeared to be novel QTLs. A total of 29 significant epistatic QTLs were also detected in present study demonstrating an important genetic basis of epistatic interactions for complex subspecies-related traits. These results suggest that the subspecies-related traits and detected QTLs should be taken into consideration to incorporate with marker-assisted selection strategy in rice breeding program. Asian rice (Oryza sativa L.), the most important crop species, being the staple food for more than half of the population in the world (Gnanamanickam 2009). This Asian rice has been differentiated in two major subspecies, indica and japonica. These two subspecies are commonly associated with differences in growth habitat. japonica type usually is well grown in temperate environments at high latitudes or altitudes especially found in the upland hill of Southern China, South East Asia, Africa, Northern America and Southern America. While indica type usually is cultivated in tropical and subtropical environments including the lowlands of tropical Asia (Khush 1997). These two subspecies are general interest of differentiation based on a number of morphological, physiological and biochemical characteristics. However, genes responsible to distinction and their roles in these two is limited to be elucidated. In current years, molecular markers progressively contribute to rapid identification of indica and japonica rice to complement of traditional characterizations (Wang et al. 1987; Morishima and Oka 1981; Oka 1991; Garris et al. 2005). Morphological and physiological diversification of domesticated taxa from the wild ancestor lead to genetically evolutionary process of plants. Domestication often involve gene admixture across isolation barrier and intensive selection (Tang et al. 2006). It is widely believed that these Asian rice subspecies was majority domesticated from O. rufipogon as its ancestor (Oka 1988; Londo et al. 2006). However, based on a quantitative trait locus (QTL) analysis in the previous (Li et al. 2006), indica rice might be domesticated from O. nivara. The traits of apiculus hair length, potassium chlorate (KClO3) solution resistance, phenol reaction and grain morphology are known as morphological and physiological characteristics which can classify them into indica or japonica. Japonica rice has been distinguished from indica rice with a higher resistance to KClO3 solution, showing negative response to phenol reaction, and longer apiculus hair length. Grain morphology, such as grain length, grain width, and grain length-width ratio are known to be important indicators of the evolution of crop due to continuous selection for large seeds during early domestication (Konishi et al. 2008; Shomura et al. 2008; Wan et al. 2008). But, identification of indica and japonica rice sometimes is divergent according to traditional and molecular markers approaches. Several studies have been performed in identifying QTLs for domestication-related traits in rice using diverse mapping population (Xiong et al. 1999; Cai and Morishima 2000; Bres-Patry et al. 2001; Cai and Morishima 2002; Thomson et al. 2003; Lee et al. 2005; Tan et al. 2008). Mapping populations in identifying QTLs for domestication- related traits used in previous studies were mostly generated from crosses of O. sativa x O. rufipogon (Xiong et al. 1999; Cai and Morishima 2000; Cai and Morishima 2002; Thomson et al. 2003; Lee et al. 2005; Tan et al. 2008) and O. sativa x weedy rice (Bres-Patry et al. 2001). Although fast progress of QTLs for rice domestication-related traits have been intensively achieved, identification of QTLs associated with target traits in different types of mapping populations can promisingly enrich diverse sets of QTLs and provides a potential source of information about natural genetic variation underlying the evolution, domestication, and breeding of rice. These varied mapping populations allow to identify new QTLs responsible for the desired traits. Therefore, in present study we used reciprocal F2 populations derived from crosses of Ilpumbyeo (Korean japonica variety) and Dasanbyeo (‘Tongil’ or Korean indica variety) to explore subspecies differentiation-related trait loci inherited from each parent. Reciprocal crosses allowed us to test for the presence of maternal genetic influence or to detect nuclear-cytoplasmic interaction on QTLs related-target traits. Moreover, among DNA markers used in thist study, a set of subspecies specific (SS) markers identified by Chin et al. (2007) were also included in identifying the QTLs associated with japonica-indica differentiation traits. The objective of this study was to identify QTLs that were targets of subspecies differentiation-related traits between indica and japonica. Two reciprocal F2 populations generated from Dasanbyeo and Ilpumbyeo were used to identify the QTLs responsible for Asian rice domestication-related traits. A total of 210 F2 progeny derived from a cross between Ilpumbyeo and Dasanbyeo (ID), and 199 F2 progeny of its reciprocal cross (DI) were produced. These populations including their parental lines, were grown at the experimental farm of Seoul National University in Suwon, South Korea as described previously (Reflinur et al. 2012). Plant materials were seeded on the plastic tunnel seedbad and thirty-day-old seedlings were transplanted to irrigated field condition at one seedling per hill with a 30 × 15 cm of spacing between seedlings. Fertilizers were properly applied at the rate of 100 kg N/ha, 80 kg P/ha, and 80 kg K/ha (100-80-80 kg/ha N-P-K). Fresh leaf tissues of the parents and each line of the mapping populations at the maximum tillering stage were collected for DNA extraction. DNA was extracted following the cetyltrimethylammonium bromide (CTAB) method described by Causse et al. (1994) with minor modification. Five agronomical traits consisted of apiculus hair length (APH), grain length (GL), grain width (GW), grain length-width (GLW) ratio, and KClO3 response (KClO3) were observed in the two F2 populations together with their parents. Fully filled grains of F3 grains were used for measuring GL and GW according to the Standard Evaluation System (SES) (IRRI 1998). Ten fully filled grain samples of rough rice for each F2 individual plant were lined up lengthwise along a vernier caliper to measure grain length and then arranged by breadth to measure grain width at 0.01 mm precision. GLW was defined as a ratio of length to width of grain. APH was measured using a microscope at 25-fold magnification. The longest two apiculus hairs of each seed were measured from each F2 individual plant and the mean was taken as apiculus hair length (Oka 1958). KClO3 resistance was determined as ratio of the mean shoot length of KClO3-treated plants to that of control (Oka 1958) using 20 seedlings from one F2 individual. For this assay, 10 of 2 cm height seedlings were soaked in 2 mL of 0.1% KClO3 solution in a 18 × 180 mL tubes and the remaining 10 seedlings, as control, were soaked in 2 mL distilled water. All tubes were kept at 28°C in a dark condition. After five days, the shoot lengths of the seedlings were measured. A total of 107 sequence-tagged site (STS) markers dispersed throughout the rice genome were used to construct a linkage map of two F2 populations. PCR analysis in the F2 populations was performed in a 20 μL total reaction volume containing 20 ng of template DNA, 0.2 μM of each primer (forward and reverse), 10 mM Tris-HCl (pH 8.3), 50 mM KCl, 0.01% gelatin, 1.5 mM MgCl2, 0.125 mM dNTPs, and 1 unit of homemade Taq DNA polymerase. Template DNA was initially denatured at 94°C for 5 minutes, followed by 35 cycles of PCR amplification under the following parameters: 30 seconds of denaturation at 94°C, 30 seconds of primer annealing at 55°C (depending upon the annealing temperature of the primers), and 30 seconds of primer extension at 72°C. A final 7 minutes incubation at 72°C was programmed to allow for the completion of primer extension on a PTC220 dual 96-well thermo-cycler (MJ Research, USA). The amplified products were separated and visualized by electrophoresis using non-denaturing 6% polyacrylamide gel in 1X TBE buffer. The linkage map construction was as described previously (Reflinur et al. 2014). The Mapmaker/EXP 3.0 program was applied and a LOD score of 3.0 was used as the threshold for declaring a linkage (Lander et al. 1987; Lincoln et al. 1992). The Kosambi function was used to convert recombinant values to genetic distances between the markers (Kosambi 1944). The chromosomal locations of the putative QTLs through linkage relationship analysis between the loci of the traits and molecular markers were resolved according to the method of composite interval mapping (CIM) by using the computer package Windows QTL Cartographer version 2.5 (Wang et al. 2006). CIM was run with the default setting for model 6 in the program (five background markers and a window size of 10 cm). Experiment-wise significance (alpha = 0.05) likelihood ratio test (LR) thresholds for QTL identification were determined with 1,000 permutations and expressed as a LOD. The phenotypic variation explained (PVE) by the underlying QTL was derived from the R-squared values. Digenic-epistatic interactions between all pairs of loci in the F2 populations were evaluated by a two-way analysis of variance using the SAS EPISTACY command (Holland 1998). A liberal P-value (P < 0.001) was used to declare epistatic interactions significant, and these interactions were further incorporated into multiple locus models with the SAS GLM procedure. Nomenclature of QTLs followed that described by McCouch et al. (1997). All measured phenotypic traits between the two parents were significantly different. The traits measured in the parents and F2 populations are shown in Table 1 and Fig. 1. Ilpumbyeo showed higher values for GW, APH, and KClO3 while Dasanbyeo revealed higher GL and GLW. All traits varied widely in the two F2 populations and the skewness for each trait was less than 1.0, indicating that the frequency distributions of all traits approximately fit normal distribution (Fig. 2). The populations, therefore, were considered appropriately to be used for a QTL analysis study. In addition, the phenotypic performances of most individual F2 plants were within the range of the two parents. Importantly, transgressive segregants were detected among F2 in GL, GW, APH, and KClO3 (Fig. 2), as expected in an interspecific cross. The strongest positive correlation (P < 0.05) was identified between GL and GW, GL and GLW in both ID and DI population but significantly negative correlations were found between GW and GLW in both ID and DI population (Table 2). In addition, KClO3 did not show significant correlations with other traits in both ID and DI populations. QTLs associated with domestication-related traits were identified and summarized in Table 3. A total of 26 main-effect QTLs were detected for five traits in the two reciprocal F2 populations. The main-effect QTLs were mapped to eight chromosomes, including chromosomes 1, 2, 3, 4, 5, 6, 8 and 11. Six QTLs for grain length were mapped on chromosome 2, 3, 4, and 6. The qGL4 located on chromosome 4 in ID population showed 48.0% PVE and additive effect on GL. Ilpumbyeo allele increased the grain length at this locus. The other five QTLs for grain length were identified in DI population, and the PVE by each QTL ranged from 1.1% to 29.0%. Over-dominance effect was observed for increasing the grain length at qGL2.1 and dominance effects were detected at qGL2.2 and qGL6. The qGL2.3 and qGL3 showed additive effect on grain length. The positive effect of the QTLs for increasing the GL at qGL2.1, qGL3, and qGL6 come from Dasanbyeo alleles, while at qGL2.2, qGL2.3, and qGL3 loci were derived from Ilpumbyeo alleles. Two QTLs for grain width (qGW11.1 and qGW11.2) were mapped on chromosome 11 accounted the PVE by each QTL was 16.5% and 14.7%, respectively in the DI population. The qGW11.1 showed additive effect for increasing GW and qGW11.2 showed dominance effect. The increased grain width at these two loci was from Ilpumbyeo alleles. Eight QTLs for GLW were mapped on chromosome 1, 2, 3, and 6. Among them, qGLW1, qGLW3.2, and qGLW6.2 were detected in ID population and qGLW2.2, qGLW3.1, qGLW3.3, qGLW6.1 were identified in DI population. Interestingly, only one QTL (qGLW2.1) was detected in both ID and DI population (Table 3). Ilpumbyeo alleles showed positive effects to increase GLW in qGLW1 and qGLW3.1 loci, whereas Dasanbyeo alleles demonstrated positive effects in the remaining loci. All the QTLs for GLW detected in the ID population showed additive effects, while in the DI population two QTLs showed additive effects and three QTLs showed dominant effect. In the ID population, the PVE by each QTL ranged from 2.5% to 13.2%, while in the DI population the phenotypic variation explained by each QTL ranged from 5.7% to 29.9% (Table 3). Totally, nine QTLs responsible for APH were identified on chromosomes 2, 3, 4, 5, 6, and 8 in the ID and DI populations. The PVE by each QTL responsible for APH in ID and DI population ranged from 2.5% to 19.0% and from 5.7% to 26.3%, respectively. Among the detected QTLs for APH, qAPH2 and qAPH4.1 showed over-dominance, qAPH4.2 showed dominance, and the remaining five QTLs showed additive effects (Table 3). Positive effects of the loci to increase the APH were mostly derived from the Ilpumbyeo allele. Despite, a short APH in Dasanbyeo (indica) compared to Ilpumbyeo (japonica), Dasanbyeo allele contributed to an increase in apiculus hair length at two putative QTLs designated as qAPH5.1 and qAPH5.2 loci located on chromosome 5. One QTL responsible for KClO3 resistance, designated as qKlCO3 was detected on chromosome 3 in ID population, accounting for 13.5% of the phenotypic variation. Ilpumbyeo allele contributed in an increase the potassium chlorate resistance at this locus. Epistatic-QTLs (hereafter EpQTLs) associated with rice domestication-related traits and their epistasis components are summarized in Table 4. A total of 29 significant EpQTLs were identified in the reciprocal F2. In general, we found that the number of locus-pairs for EpQTLs in ID population was higher than that of in DI population. Twenty out of 29 significant EpQTLs were detected in ID population and the remaining EpQTLs were in DI. Among the five locus-pairs for EpQTLs responsible for GL, the highest significant interaction was detected between S01022 and S120011B loci, accounted for 18.4% of phenotypic variation. Interestingly, these two loci have also provided the highest PVE (20.2%) among eight digenic loci responsible for GW detected in this study. Of the total 11 locus-pairs for EpQTLs responsible for GLW, interaction between S07050A and S12009A loci was the most significance locus-pairs affected to GLW, accounting for 13.4% of phenotypic variation. Meanwhile, of the total five EpQTLs responsible for APH, locus-pairs of S02057B and S01001 revealed the highest value of PVE (12.6%). It is noted that the locus pairs of EpQTLs associated with all measured traits detected in ID and DI populations mostly differed, suggesting that epistatic QTLs are population-dependent even in the reciprocal populations which were derived from the same parental lines, Ilpumbyeo and Dasanbyeo. Among the significant EpQTLs found in the present study, only one EpQTL was detected between significant main-effect QTLs, qAPH4.1 and qAPH6. Both the later QTLs were found to be responsible for APH. There was no EpQTL detected for KClO3 resistance in either ID or DI population. Large difference in the genetic composition between the two crossing parents is required for the successful QTL analysis. For measured traits in this study, the two parents, Ilpumbyeo and Dasanbyeo, showed significant differences (Table 1). Among 26 main effect QTLs responsible for subspecies differentiation-related traits detected in this study, the regions of 14 QTLs were overlapped with those of previously reported QTLs while the remaining 12 QTLs were novel (Table 5). Of the six QTLs for GL, qGL3 and qGL4 were newly detected in this study, while the others were reported in the previous studies. Based on the Nipponbare Pseudomolecule annotated by IRGSP Build5, the qGL2.1 located at 5.30 – 12 Mbp on chromosome 2, is overlapped with the QTLs for grain length reported by (Tan et al. 2000). The qGL2.2 located at 24.6 – 29.9 Mbp on chromosome 2 is overlapped with the previously reported QTL of qGL-2 (Wan et al. 2005). The qGL2.3 located at 29.9 – 32.9 Mbp on chromosome 2 is overlapped with the location of previously reported QTLs of qGl-2a (Li et al. 2003) and qgl2 (Qiao et al. 2008). The physical location of qGL6 on 7.8 – 8.8 Mbp in chromosome 6 corresponds to qgl6 reported by (Qiao et al. 2008). For GW, one QTL on chromosome 11, qGW11.1 was novel and the other QTL of qGW11.2 located on 1.3 – 3.3 Mbp in chromosome 11 correspond to a QTL for grain width reported by Ge et al. (2005). Of the total eight QTLs for GLW, two QTLs on chromosome 6, qGLW6.1 and qGLW6.2 were found as new QTLs. However, the remaining six QTLs for GLW corresponded to those reported by previous studies. The qGLW1 located at 2.27 – 7.46 Mbp in chromosome 1 is overlapped with qLWR-1 (Wan et al. 2005). Locus qGLW2.1 located at 5.3 – 14.1 Mbp in chromosome 2 corresponds to qgl2.1 reported by Qiao et al. (2008). The qGLW2.2 located at 17.4 – 19.9 Mbp on chromosome 2, correspond to qLWR-2 reported by Wan et al. (2005) and qgs2.1 (Qiao et al. 2008). The qGLW3.1 located at 10.8 – 24.3 Mbp on chromosome 3 was overlapped with the previous reported QTLs for grain length-width ratio, qgs3.1 (Qiao et al. 2008), qLWR-3 (Wan et al. 2005) and lwr3.1 (Li et al. 2004). The qGLW3.2 located at 24.4 – 25 Mbp on chromosome 3 correspond to QTL for GLW reported by (Tan et al. 2000). The qGLW3.3 located at 25 – 27.4 Mbp in chromosome 3 correspond to qgs3.2 reported by Qiao et al. (2008). The parental lines used in crosses to generate the F2 mapping populations used in present study were the same as those in previous study (Qiao et al. 2008). Although the direction of parental contribution was the same, the main-effect QTLs for grain traits detected across populations was different. Some QTLs were only detected in F2 or BC1F1 populations. This phenomenon may be caused by different genetic background due to the differences in cross direction in developing mapping populations. In present study, six QTLs for grain length mapped on chromosomes 2, 3, 4, and 6 were detected in F2 mapping populations. While in previous study, by using BC1F1 mapping populations a total of 4 QTLs for grain length mapped on chromosomes 1, 2, 6, and 8 were detected. Of these, the only qGL2.2 was found co-located with qgl2 (Qiao et al. 2008). The number of QTLs responsible for grain width detected in F2 mapping populations were lower than those found in BC1F1 populations. In present study, two QTLs for grain width derived from F2 populations were identified in different chromosomal location with those eight detected grain width related QTLs in BC1F1 populations. While for the grain shape trait, a total of eight and six QTLs were detected in F2 and BC1F1 populations, respectively, of which four QTLs appeared in both F2 and BC1F1 populations (Table 5). While the remaining four QTLs detected in F2 populations were differed from those identified in BC1F1 populations (Qiao et al. 2008). The similar phenomenon were also observed by Lu et al. (2013) which compare QTL for grain-quality traits across a rice F2 population and backcross inbred lines (BILs). They identified a total of 27 distinct QTLs for five grain traits of which 17 QTLs were detected from F2 and 14 QTLs from BILs in the year 2009 and 15 from BILs in year 2010. According to Lu et al. (2013) many influencing factors, such as population type and size, number of molecular markers, and environmental conditions may affect the mapping results. For APH, nine QTLs were detected. Of these, six QTLs consisting of qAPH2, qAPH3.1, qAPH4.1, qAPH4.2, qAPH5.1, and qAPH5.2 were newly identified in this study, whereas other regions of three QTL for APH including qAPH3.2, qAPH6, and qAPH8 were previously reported as QTL for APH (Cai and Morishima 2002). Only one QTL related to KClO3 resistance, qKClO3, was detected and this QTL is newly detected in this study. The gene action of the QTLs found in the present study showed the levels of partial to over dominance effects suggesting the complexity of these traits (Table 4). The degree of dominance is given as a ratio of dominance to additive effect (d/a) according to Edwards et al. (1987). The gene action for all QTLs responsible for grain morphology, such as GL, GW, and GLW, showed the levels of additive and non-additive effects. Previous studies reported that additive or partial dominance and non-additive effects were important to control grain shape or grain dimension (Singh and Singh 1985; Redona and Mackill 1998). In ID population all QTLs for grain morphology showed the additive or partial dominance effects, while that of in DI population exhibited partial to dominance effects. However, qGL2.1 had shown over-dominance toward increase grain length in DI population. A QTL for KClO3 resistance showed additive effect in the present study. Furthermore, the gene action of the QTLs responsible for APH detected on chromosomes 3, 5, 6, and 8 exhibit additive effects, while that of on chromosome 2 and 4 exhibit dominance to over dominance effects. Most QTLs responsible for subspecies differentiation-related traits, except for qGLW2.2 and qAPH4.1, were detected only in one of the reciprocal F2 populations (Table 3). Theoretically, detected QTLs should be the same in both reciprocal F2 populations. However, detection of QTLs in only one of the two reciprocal F2 populations demonstrates that inheritance of natural subspecies differentiation-related traits is complex and probably involves cytoplasmic factors and/or it might also be influenced by nuclear and cytoplasmic interactions. Other possible reasons causing the differences in the detected QTLs between the two reciprocal F2 populations may include either or both hybrid sterility gene(s) and segregation distortion (SD) effects in an inter-subspecific cross in rice. For instance, the differences in the detected QTLs between the two reciprocal F2 populations, such as those responsible for grain width (qGW11.1 and qGW11.2), grain length (qGL2.1, qGL2.2, qGL2.3, qGL3, and qGL6), apiculus hair length (qAPH2, qAPH3.1, qAPH3.2, and qAPH6), and KClO3 resistance (qKClO3) might be caused by segregation distortion effect. It is indicated by certain detected QTLs are co-locate at same chromosomal regions of certain SD loci reported by (Reflinur et al. 2014). While the effects of both hybrid sterility gene (s) and SD loci affecting the differences in the detected QTLs between the two reciprocal F2 populations were detected on QTLs for grain length-width ratios and that for apiclus hair length. For example, QTL for grain length-width ratio (qGLW1) is co-located at the same region of chromosome 1 for QTLs for spikelet fertility (qSF1) reported by (Reflinur et al. 2012) and SD loci (Reflinur et al. 2014). Other two QTLs (qGLW3.1 and qGLW3.2) for grain length-width ratio which only detected in one of the reciprocal populations were co-located with both SD loci on chromosome 3 reported by (Reflinur et al. 2014) and qSF3.2 responsible for spikelet fertility (Reflinur et al. 2012). In addition, one QTL detected only in one of the two reciprocal population which is responsible for grain width ratio (qGLW6.1) was also might be related to both hybrid sterility gene and SD effects. This QTL was co-located with SD loci (Reflinur et al. 2014) at chromosome 6 and that with QTL for spikelet fertility (qSF6.2) reported by (Reflinur et al. 2012). Therefore, regarding the complexity of natural inheritance of such traits, further study is needed to elucidating such a phenomenon. Of the total 29 EpQTLs found in the two F2 populations, we detected only one EpQTL which is responsible for APH as interactions between two main-effect QTLs, qAPH4.1 and qAPH6. While the rest of 28 EpQTLs did not include any of significant QTLs that had major effects on the relevant traits. These findings demonstrate that epistatic interactions are an important genetic basis for complex domestication-related traits and should be taken into consideration, especially when a marker-assisted selection strategy is adopted in a breeding program. Prior to limited mapping population used in present study which only derived from two rice varieties, the detected QTLs for indica-japonica differentiation traits could be explained by the subspecies-specific (SS) STS markers as reported by Chin et al. (2007). Most the main-effect QTLs and digenic epistasis loci responsible for subspecies differentiation-related traits detected in present study were more likely linked to SS STS markers. Fifteen out of 26 detected main-effect QTLs and 26 out of 29 significant EpQTls for indica-japonica differentiation traits were indicated by the primers categorized as SS markers. Finally, we summarized that a total of 26 main-effect and 29 significant epistatic QTLs for japonica-indica differentiated traits which located on chromosomes 1, 2, 3, 4, 5, 6, and 8 were identified in current study. Of the total 26 detected QTLs, 12 QTLs were novel, whereas the remaining 14 QTLs were corresponded to the previously reported QTLs suggesting the functional conservation of QTLs across populations. A strong association between SS markers with QTLs responsible for indica-japonica differentiation traits was confirmed in present study. This study was supported by a grant from the Next- Generation BioGreen 21 Program (No. PJ013165) of the Rural Development Administration, Korea. Fig. 1. Performance and significant differences between Ilpumbyeo (japonica) and Dasanbyeo (indica) based on importance morphological-physiological characters. A. Performance of parents and F1 plants; B. Panicles of parents and F2; C. Panicles of parents and F3; D. Spikelet of parents; E. Reaction of parents to phenol solution; F. Response of parents to KClO3; G. Apiculus hair length of parents. IP is referred to Ilpumbyeo; DS is referred to Dasanbyeo; IP/DS or DS/IP is F1 hybrids. 1. Natural color of hulls; 2. Brown rice; 3. The phenol reaction of rice hulls; 4. The phenol reaction of brown rice. Fig. 2. Frequency distribution of rice domestication-related traits in the reciprocal F2 populations generated from Ilpumbyeo and Dasanbyeo. IP and DS refer to Ilpumbyeo and Dasanbyeo, respectively. ID is abbreviation for Ilpumbyeo/Dasanbyeo (black bar), whereas DI is Dasanbyeo/Ilpumbyeo (white bar). Descriptive statistics of measured traits in parents and F2 populations. GL is abbreviation for grain length, GW is for grain width, GLW is for grain length-width ratio, APH is for apiculus hair length, and KClO3 is for potassium chlorate resistance. SD is the abbreviation for standard deviation. All traits between the parents were significantly different at the 0.05 probability level. ID is F2 population generated from Ilpumbyeo × Dasanbyeo, whereas DI is its reciprocal cross. The skewness value was obtained by applying a normality test in SAS. Correlation coefficients among traits in the two reciprocal F2 populations used in this study. The upper table (A) refers to the correlation coefficients among traits in the F2 lines derived from Ilpumbyeo × Dasanbyeo, while in the lower table (B) refers to the F2 lines derived from its reciprocal cross (Dasanbyeo × Ilpumbyeo). abbreviations are the same as that shown in Table 1.
denote significance differences at 0.05 and 0.0001 probability levels, respectively. 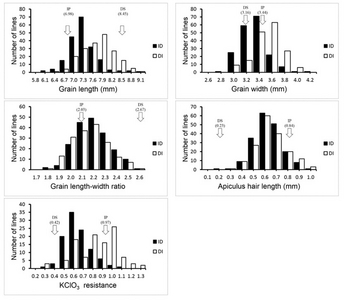 Main-effect QTLs affecting grain length (GL), grain width (GW), grain length-width ratio (GLW), apiculus hair length (APH), and KClO3 resistance in the reciprocal F2 hybrids. Abbreviation are the same as that shown in Table 1. Underlined markers refer to the nearest loci of a putative QTL. Dominance (d) effect. A positive sign means dominance for a higher value of the trait. A negative value means dominance for a lower value of the trait. A = additive or partial dominance (0 < |d/a| < 0.55); D = partial dominance or dominance (0.55 < |d/a| < 1.20), OD = overdominance (|d/a| > 1.20). The scale of ratio d/a was adopted from (Edwards et al. 1987). Percentage of individual phenotypic variances explained by the QTL, values were determined by Windows QTL Cartographer, Version 2.5. Digenic epistatic QTL pairs affecting grain length (GL), grain width (GW), grain length-width ratio (GLW), and apiculus hair length (APH) in two reciprocal F2 populations generated from crosses between Ilpumbyeo and Dasanbyeo. The abbreviations are the same as that shown in Table 1. I = Ilpumbyeo, D = Dasanbyeo. Epistatic components include additive-by-additive (aa′), dominance-by-additive (da′), additive-by-dominance (ad′), and dominance-by-dominance (dd′). represent significant at the 0.005 and 0.001 probability levels, respectively. Bold letters in loci names indicate digenic epistasis interaction between two main-effect QTLs (between qAPH4.1 and qAPH6). Comparison of QTLs for domestication-related traits with previous studies in rice. Bres-Patry, C, Lorieux, M, Clement, G, Bangratz, M, and Ghesquiere, A (2001). Heredity and genetic mapping of domestication-related traits in a temperate japonica weedy rice. Theor Appl Genet. 102, 118-126. Cai, HW, and Morishima, H (2000). Genomic regions affecting seed shattering and seed dormancy in rice. Theor Appl Genet. 100, 840-846. Cai, HW, and Morishima, H (2002). QTL clusters reflect character associations in wild and cultivated rice. Theor Appl Genet. 104, 1217-1228. Causse, MA, Fulton, TM, Cho, YG, Ahn, SN, Chunwongse, J, and Wu, KS (1994). Saturated molecular map of the rice genome based on an interspecific backcross population. Genetics. 138, 1251-1274. Chin, JH, Kim, JH, Jiang, W, Chu, SH, Woo, MO, and Han, L (2007). Identification of subspecies-specific STS markers and their association with segregation distortion in rice (Oryza sativa L.). J Crop Sci Biotechnol. 10, 175-184. Edwards, MD, Stuber, CW, and Wendel, JF (1987). Molecular marker facilitated investigations of quantitative trait loci in maize .1. Numbers, genomic distribution and types of gene action. Genetics. 116, 113-125. Ge, XJ, Xing, YZ, Xu, CG, and He, YQ (2005). QTL analysis of cooked rice grain elongation, volume expansion, and water absorption using a recombinant inbred population. Plant Breed. 124, 121-126. Holland, JB (1998). EPISTACY: A SAS program for detecting two-locus epistatic interactions using genetic marker information. J Hered. 89, 374-375. Khush, GS (1997). Origin, dispersal, cultivation and variation of rice. Plant Mol Biol. 35, 25-34. Konishi, S, Ebana, K, and Izawa, T (2008). Inference of the japonica rice domestication process from the distribution of six functional nucleotide polymorphisms of domestication-related genes in various landraces and modern cultivars. Plant Cell Physiol. 49, 1283-1293. Kosambi, DD (1944). The estimation of map distances from recombination values. Ann Eugenic. 12, 172-175. Lander, ES, Green, P, Abrahamson, J, Barlow, A, Daly, MJ, and Lincoln, SE (1987). MAPMAKER: An interactive computer package for constructing primary genetic linkage maps of experimental and natural populations. Genomics. 1, 174-181. Lee, SJ, Oh, CS, Suh, JP, McCouch, SR, and Ahn, SN (2005). Identification of QTLs for domestication-related and agronomic traits in an Oryza sativa × O. rufipogon BC1F7 population. Plant Breed. 124, 209-219. Li, CB, Zhou, AL, and Sang, T (2006). Genetic analysis of rice domestication syndrome with the wild annual species, Oryza nivara. New Phytol. 170, 185-193. Li, JM, Xiao, JH, Grandillo, S, Jiang, LY, Wan, YZ, and Deng, QY (2004). QTL detection for rice grain quality traits using an interspecific backcross population derived from cultivated Asian (O. sativa L.) and African (O. glaberrima S.) rice. Genome. 47, 697-704. Li, ZF, Wan, JM, Xia, JF, and Zhai, HQ (2003). Mapping quantitative trait loci underlying appearance quality of rice grains (Oryza sativa L.). Acta Genetica Sinica. 30, 251-259. Londo, JP, Chiang, YC, Hung, KH, Chiang, TY, and Schaal, BA (2006). Phylogeography of Asian wild rice, Oryza rufipogon, reveals multiple independent domestications of cultivated rice, Oryza sativa. Proc Natl Acad Sci USA. 103, 9578-9583. Lu, B, Yang, C, Xie, K, Zhang, L, Wu, T, and Li, L (2013). Quantitative trait loci for grain-quality traits across a rice F2 population and backcross inbred lines. Euphytica. 192, 25-35. McCouch, SR, Cho, YG, Yano, M, Paul, E, and Kinoshita, T (1997). Report on QTL nomenclature. Rice Genet News. 14, 11-13. Morishima, H, and Oka, HI (1981). Phylogenetic differentiation of cultivated rice. 22. Numerical evaluation of the indica-japonica differentiation. Jpn J Breed. 31, 402-413. Oka, HI (1958). Intervarietal variation and classification of cultivated rice. Indian J Genet Pl Br. 18, 79-89. Qiao, YL, Jiang, WZ, Rahman, ML, Chu, SH, Piao, R, and Han, LZ (2008). Comparison of molecular linkage maps and QTLs for morphological traits in two reciprocal back-cross populations of rice. Mol Cells. 25, 417-427. Redona, ED, and Mackill, DJ (1998). Quantitative trait locus analysis for rice panicle and grain characteristics. Theor Appl Genet. 96, 957-963. Reflinur, , Chin, JH, Jang, SM, Kim, B, Lee, J, and Koh, H-J (2012). QTLs for hybrid fertility and their association with female and male sterility in rice. Genes & Genomics. 34, 355-365. Reflinur, , Kim, B, Jang, SM, Chu, S-H, Bordiya, Y, and Akter, MB (2014). Analysis of segregation distortion and its relationship to hybrid barriers in rice. Rice. 7, 3. Shomura, A, Ebana, K, Ebitani, T, Kanegae, H, Konishi, S, and Yano, M (2008). Deletion in a gene associated with grain size increased yields during rice domestication. Nat Genet. 40, 1023-1028. Singh, NB, and Singh, HG (1985). Heterosis and combining ability for kernel size in rice. Indian Journal of Genetics. 45, 181-185. Tan, L, Zhang, P, Liu, F, Wang, G, Ye, S, and Zhu, Z (2008). Quantitative trait loci underlying domestication-and yield-related traits in an Oryza sativa × Oryza rufipogon advanced backcross population. Genome. 51, 692-704. Tan, YF, Xing, YZ, Li, JX, Yu, SB, Xu, CG, and Zhang, Q (2000). 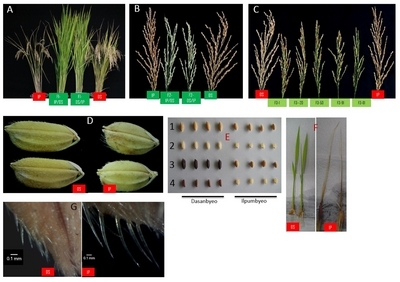 Genetic bases of appearance quality of rice grains in Shanyou 63, an elite rice hybrid. Theor Appl Genet. 101, 823-829. Tang, T, Lu, J, Huang, JZ, He, JH, McCouch, SR, and Shen, Y (2006). Genomic variation in rice: Genesis of highly polymorphic linkage blocks during domestication. PLoS Genet. 2, 1824-1833. Wan, JM, Wan, XY, Weng, JF, Jiang, L, Bi, JC, and Wang, CM (2005). Stability of QTLs for rice grain dimension and endosperm chalkiness characteristics across eight environments. Theor Appl Genet. 110, 1334-1346. Wan, JM, Wan, XY, Weng, JF, Zhai, HQ, Wang, JK, and Lei, CL (2008). Quantitative trait loci (QTL) analysis for rice grain width and fine mapping of an identified QTL allele gw-5 in a recombination hotspot region on chromosome 5. Genetics. 179, 2239-2252. Wang, XK, Cheng, KS, Huang, NW, Luo, J, Lu, YX, and Liu, GR (1987). Studies on two important rice types concerning the origin and differentiation of Asian cultivated rice. Acta Genetica Sinica. 14, 262-270. Xiong, LX, Liu, KD, Dai, XK, Xu, CG, and Zhang, QF (1999). Identification of genetic factors controlling domestication-related traits of rice using an F-2 population of a cross between Oryza sativa and O. rufipogon. Theor Appl Genet. 98, 243-251.